Finding the right electrician isn’t easy. Whether you need help with a small project like replacing a switch or an outlet or you have a much bigger task in mind, you need a fully qualified and licensed electrician who you can rely on to get the job done right and, more importantly, safely. At Lightfoot Mechanical, we understand, and we are here to lend a hand anytime you find yourself in need of an electrician in Crowley, TX. We have build a team of exceptional local electricians, and thanks to our Master Electrician, our customers never need to worry about the consequences of an electrical project gone wrong. Out team proudly offers a vast range of professional electrical services for both residential and commercial customers, and we would be more than happy to help with all of your electrical needs. From wiring and rewiring to ceiling fan installation, main panel upgrades, and more, we offer a complete range of expert electrical services for homeowners. Our modern lives require more power than ever before, and most homes simply weren’t built to keep up with the demand. Whether you need to have a few new outlets installed or you need to have your main panel upgraded to meet your electrical needs, we can help. We also offer professional appliance and ceiling fan installation and innovative indoor and outdoor lighting solutions to meet any style. From minor repairs to multi-million dollar builds for large companies, we are equipped to handle any commercial electrical need. 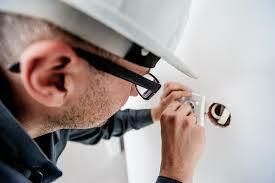 Our fully licensed electricians have the knowledge and skills necessary to handle any commercial project. They also take the time to understand the unique needs of each individual business they work with to ensure fully customized solutions. For safe and energy efficient commercial electrical services in Crowley, TX, and the surrounding areas, there’s simply no one better for the job than the experts at Lightfoot Mechanical. Whether you need a hand with commercial or residential electrical projects, we are your best choice when you are looking for an electrician in Crowley, TX. We’ve been serving the area for several years, and our team is made up of licensed electricians who you can trust to tackle even the most complex electrical projects. If you need an electrician in Crowley, TX, or the surrounding areas, contact Lightfoot Mechanical today!